Hi friends and future friends! Sorry again about the delay in uploading Episode 6. I know we're almost at episode 7 already, but on the plus side it'll come that much quicker. Let's just right into it. When we last left off Yeon Doo had told the reporters that she'd be willing to do a interview. They take her to their very sketchy creeper van to interview her. Yeon Doo tries to ensure that the interview will actually help her homeroom teacher and the reporter is evasive. He asks her about the fact that the students were being used to help build other specs which she says was true at first but now everyone's working together as a team. I get the very bad feeling that he's going to take her words horribly out of context. Flashback to Pinnochio anyone? We don't see the whole interview, but afterward both Yeol and Ha Joon approach the reporter together looking none too happy. Yeol asks the reporter if he had a good interview with Yeon Doo to which the reporter agrees that he did. Ha Joon gets angry and kicks the reporter. When the reporter is surprised at the aggression, Yeol explains that he just broke the Interrogative Security Law that is supposed to protect the interviewee's identity and then Yeol threatens to sue him if he doesn't properly protect Yeon Doo. Be still my heart. Yeol and Ha Joon both acting like Yeon Doo's private bodyguards and going to protect her. It's almost too much. Afterward Ha Joon walks by Yeon Doo and she stops him and has him sit down to eat some gummy bears with. She admits to him that she gave the interview and he tells her that he already knew; that he saw her talking to the reporter. She wonders if he had secretly wanted to give the interview as well which he doesn't outright admit, but says he hopes Teacher Yang will be alright. That's looking unlikely, though, as the 60 minutes special on Sevit High has been pulled. Teacher Yang calls the reporter to find out what happened and learns that the higher ups at the station told him to trash the story and the reporter warns Teacher Yang to be careful as well. It turns out that wormy teacher found out realized that Teacher Yang was plotting with 60 minutes and reported it to the principal. They know they need to get rid of him, but also know they can't fire him for being a whistleblower. Instead, they make it their mission to be on the lookout to find anything they can to fire him with. What I was thinking here was that they were going to frame it to make it look like he and Yeon Doo had an inappropriate relationship, which would help the principal to get rid of both of them at the same time. Yeon Doo is feeling down about the report getting trashed and Yeol tells her that it's for the best, that it helps to keep her safe. He also reminds her that she needs to focus on the competition between her team and Soo Ah's. When it comes down to the time to show the coach their routines, Soo Ah and the Real King members perform some of the flashy cheer moves they learned from the National Team. Only Dong Jae doesn't perform with them as he still hasn't gotten over his phobia. Yeon Doo and the members of Baek Ho perform a fun dance number that allows some of the individuals to shine. Each team loves the others' performance, with the exception of the perpetual sourpuss, Soo Ah. When it comes down to decide the winner, the coach agrees that both team had great aspects to their performance, but announces that because Soo Ah did not include Dong Jae, that Yeon Doo is the winner and therefore is now the captain. And because both routines are good, they are going to combine them together for the athletic competition. I thought Soo Ah's routine was a little bit better, but the Coach recognized that Soo Ah didn't even attempt to include Dong Jae and obviously was looking for more than just ruthless motivation, but leadership skills as well. The coach is becoming a real ally to these kids. She was loving their performances and cheering them on. She's actually quite adorable. I really hope that her and Teacher Yang become a couple. They'd be cute together. So as you might have expected, Soo Ah is furious that she lost the captain position and to add to her fury she find out that Teacher Yang was the whistleblower. Her mom reassures her that the adults will take care of him, but she doesn't trust that.Later, the cheer team is practicing, trying to prepare for the upcoming competition and the coach enlists Teacher Yang to be the spotter for Jae Young, of the girls from Baek Ho. Her partner stumbles and so Jae Young falls backward. Teacher Yang is there to catch her and protect her from getting hurt, but she yells at him as he inadvertently touches her chest while doing so. Everyone else realizes that this was necessary in order to keep her from getting her, but she's upset and embarrassed and leave the classroom. Once she has time to get over her embarrassment Jae Young realizes that he didn't do it on purpose, but before she has time to make those feelings known Soo Ah appears and convinces the other Baek Ho girls that they need to get back at Teacher Yang for being the whistleblower. So they go to the principal and tell her that Teacher Yang intentionally touched Jae Young inappropriately. The moms of all the Baek Ho students find out (I still can't figure out why there are so many more moms than Baek Ho students) and come to the school absolutely irate demanding that he be fired. I know Soo Ah was low, but this stunt has sunk her to a whole another level. This will ruin Teacher Yang's life and is completely false. It's girls like her that make it so that girls who are seriously taken advantage of aren't taken seriously. The Coach comes into the principal's office to explain that the touch was necessary in order to prevent Jae Young from getting hurt. The principal tells him that she'll submit this to the education office and see what they have to say about it. Rumors start to float around the school about Teacher Yang and althoug he's ashasmed and embarrassed he continues to teach. Yeon Doo is absolutely upset, knowing that he's being framed, and when whispers start to circulate in Teacher Yang's class while he's teaching, she can't take it anymore and stands up to give them a piece of her mind. But before she has the chance, Yeol stands up and has Yeon Doo sit down. He then goes on to point out that the girls from Baek Ho were the main targets of the story Teacher Yang gave as a whistleblower and no one had ever seen Teacher Yang sexually harass girls. Yeol points out that the girls are lying to get Teacher Yang kicked out. After class, Yeon Doo is proud of Yeol but asks him why he did it. He tells he did it because if he didn't, she would without worrying about the consequences or pain it caused her. Yeon Doo questions what the means and he tells to think hard about it. Yeon Doo goes to Teacher Yang to encourage him and tell him that there are those who know he's good and are on his side. It seems to distress him how much of the scandal she is taking upon herself to try to fix and tells her he'll take care of it, but appreciates how worried she is about him. Soon after trying to cheer up, Teacher Yang, Yeon Doo comes across a notice that Teacher Yang is to be fired that day. Ha Joon and Yeol come upon her and try to tell her that there was nothing she could have done, but she tells them that it's not over yet. All eyes are on Teacher Yang in the lunchroom and whispers abound, but he tries to keep his head up. When he sits down at a table, all the students sitting nearby get up and walk away. So Teacher Yang begins to eat his lunch alone, but not for long. Yeon Doo and Dong Jae sit down at the table with smiles and being to joke with the teacher and moments later Yeol and Ha Joon have joined as well with smiles on their faces- especially touching considering the rarity of Ha Joon's smiles. If this scene wasn't one of the sweetest ever. These kids have better hearts than most adults I know. 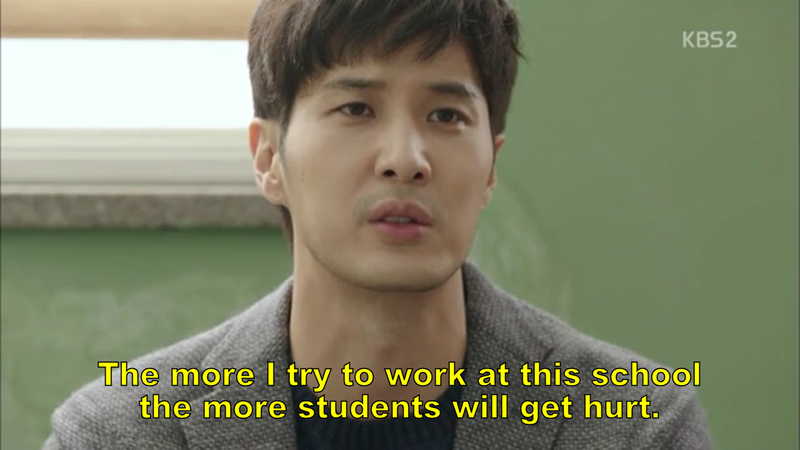 Yeol and Ha Joon who are committed to helping Teacher Yang now, start a petition to allow Teacher Yang to keep his job and submit it to the education office. That's when the principal finds out. But when Yeon Doo calls a few days later to check on the status, there is no such petition to be found. Meanwhile, Teacher Yang is brought before the education board on the charges of inappropriately touching Jae Young. They bring her in and she seems visibly shaken by the impact of her lie, but doesn't recant. Teacher Yang, believing Jae Young to be earnest in her belief that he intentionally touched her, tells the board that it's his fault and he'll take responsibility and resign. Afterward, Jae Young confesses to her mom that Teacher Yang never touched her and her mom tells her to keep quiet, that if she confesses not only will she be known for lying, but also the details on the spec-stacking will become known. Because Jae Young's uncle is a congressman, it will mean a big deal to her family. Jae Young is still upset and goes to Soo Ah, angry at her because Soo Ah said that he would only get a pay reduction. Soo Ah tells her it was her own fault for being too stupid not to realize that he would be fired. Yeol and Ha Joon are feeling a little down after Teacher Yang's firing. While Yeol seems frustrated at how stubborn Yeon Doo was on the matter at first Ha Joon tells him that despite what Yeol says, he's acting like he did care about Teacher Yang. Ha Joon addds that he's glad he helped Yeon Doo try to save Teacher Yang. I think it helped him find meaning in his life. Realizing that he doesn't always have to accept things the way they are. What Ha Joon does next, really highlights how his heart and character are vastly different from the cold facade he put on in the beginning of the series. He goes to visit his severely abusive father at work and gets on his knees to beg him to help get Teacher Yang his job back since he's on the school board. His father scoffs and tells Ha Joon that he was the one who made the petition disappear and that he wanted Teacher Yang gone. Yeon Doo's mom's spidey senses must have been tingling when she showed up at Sevit High to give Yeon Doo some comfort. Yeon Doo, of course, is more than happy to see her. These two are absolutely adorable and I could only hope that if I had a daughter one day we'd have the same relationship as these two. Yeon Doo admits to her mom that she did give the interview after all and the two joke about how similar they are. Yeon Doo's mom tells her that she really only told her not to do it because it was the "mom" thing to do, but really what she wanted for Yeon Doo was for her to follow her heart no matter what it told her to do. As Yeon Doo is walking her mom out, they come across Yeol who greets them politely after Yeon Doo informs him that it's her mom. After she thinks he's out of earshot, she tells Yeon Doo that he's handsome and that she should go out with someone like him. Yeon Doo scoffs as daughters do in these types of situations and Yeol who isn't actually out of earshot doesn't seem happy at her scoff. The next day at cheerleading, Yeon Doo is distracted by the whole Teacher Yang situation and the coach gets after her. She tells her that it's a cheerleader's responsibility not to cheer just for fun, but to cheer others on and to cheer others up. Yeon Doo seems to have an idea. After practice, Yeon Doo approaches Jae Young and the other girl from Baek Ho and tells them she needs their help and guilts them about Teacher Yang, knowing that they don't feel good about the way things turned out. She finds Teacher Yang and makes him promise to show up at the athletic competition and he says he will. The day of the athletic competition and Yeol comes across Yeon Doo who is pacing nervously alone in the hall. He gives her a carton of vanilla milk, telling her he wants to distinguish himself from Dong Jae. He then tells her that at first, he found her funny and fun but lately he's been making her feel all sorts of different emotions from fear to anger. She seems not to know what to make of this and apologizes before starting to walk away. But then Yeol grabs her into a tight hug and tells her to cheer up. Yeon Doo is shocked speechless. A member of Real King comes running up to tell them that Teacher Yang is there and they break apart. Yeol seeming quite happy and Yeon Doo quite startled. Together they go and look out in the audience, to see Teacher Yang trying to slink into an unnoticed section of the audience. The whole team seems excited that he's there. Coach sees him as well and motion him to sit next to her in the front, telling him that's where he belongs, saying that he'll be their teacher forever. The cheer teams gets on stage and performs their cheer routine flawlessly with cheer and dance moves combine. Then when they finish, they pick up signs that they incorporated into their routine before flipping them over to reveal the messages "Teacher Yang didn't touch me", "Please have him come back, he was wrongly accused", and "Cheer Up! You Have Us!" He watches on in gratefulness and tears well up in his eyes as they begin to chant his name. The coach's face tells us that she couldn't be prouder. All of the cheer team smiles at him and cheers him on except for Soo Ah who didn't know it was coming and is outraged. She's not alone as the principal, wormy teacher, and Soo Ah's mother all watch from the audience with the same expression. How incredibly moving was this scene? These kids not only have the biggest hearts, but they are so perservearant. Every time they're knocked down they get right back up. Not only that, but they have so many layers. Even the girls from Baek Ho who started this drama helping Soo Ah put all Yeon Doo's personal belongings in the washing machine, have started to make friends with the Real King members and attempt to right their wrong of falsely accusing Teacher Yang. I'm proud of all these kids as if I knew them personally. Except for Soo Ah, but I can only hope that they start to be a positive influence to her. I can't wait to see what we have in store for us in the second half of this amazing drama. See you soon friends! Until then catch up on the series so far with all of my other recaps by clicking below!